Together with some of my friends I've been to Munich to celebrate the german beer festival of Oktoberfest which was amazing! This was one of these long weekend where you forget to really pack a suitcase and being there is more important than having a sightseeing plan. We spent three days in Munich which wasn't too much but we had great fun anyway. Besides it really is a beautiful city with a nice places to visit during the day and great clubs to go dancing at night, especially at bit further from the city centre you'll find a lot of cool bars and clubs. I remember we went to a place called Housbanof which was open till 5 in the morning and easily reached by tram. The only problem was the way back and considering the fact that there is no public tram service between 5 and 7 in the morning we had to sleep on the benches at the tram station. A short holiday which turned into a big Oktoberfest adventure! Did you enjoy Celebrating Oktoberfest in Munich and have you been on a holiday in Munich, Germany? 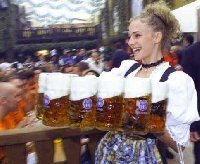 Pictures of Oktoberfest in Munich, Germany. Liked: The beer, the city and the clubs. Disliked: The busride to get to Munich.